KARACHI: Articles 19 and 19A of the Constitution of Pakistan guarantee citizens’ freedom of speech and expression but why is it that, in 2015, we are not free to express ourselves without fear, asked actress Nadia Jamil while moderating a session on ‘Freedom of Expression. What Sets the Boundaries?’ on day one of the School of Tomorrow conference. “Freedom of expression is not when you shout fire in a crowded room where there is no fire, and cause a stampede,” said writer Muneeza Shamsie. “It has to do with good governance and [adherence to the] law,” she explained. She said the idea of freedom of speech is related to governance and law, which has been lost in our country. Dr Jawad Syed, professor of organisational behavior and diversity management at the University of Huddersfield, said there is a sense of fear when it comes to expressing ones thoughts in Pakistan, a fear that is both internal and external. The definition of freedom of expression, as per the international community is the right to seek, receive and disseminate information, he explained. “We shouldn’t be hypersensitive about this information,” he said. “By voicing insight on religion would I [end up] like Salman Taseer?” Dr Syed asked, terming this an institutional fear that hinders freedom of expression. 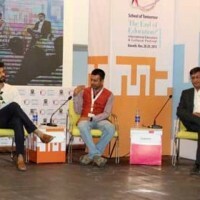 “It’s my right to dislike you but when I put that dislike in action, that becomes a problem,” said Harsh Narayan, creative director at Dragons Lab, an Indian animation company. “Imposing your personal dislikes onto another person is a way of curbing their freedom and we must accept diversity of thought,” he stressed. “We have become more accepting of violence and therefore complicit in that violence,” claimed Shamsie. Dr Syed added to this by saying, “I should have the right to [express an opinion that may be offensive to some] but no one should have the right to exercise violence against me”. He explained that freedom of speech must be limited, however, when harm is intended or implicated by that speech. That is where regulation comes in, according to actor and filmmaker Adnan Malik. “You can be as right-wing as you want but, if you go a little on the left, you aren’t given space [to express yourself],” he lamented, adding that people, especially public figures, need to self-censor. “[Television] has to be integrated with fair representation from each community,” said Malik. “Expression of what minorities feel should be part of the central dialogue,” urged Shamsie. She claimed separate channels according to religion will increase the division between communities.